Every year, stations in cities across Canada take turns sharing local homelessness issues for the rest of the country to hear. Edmonton’s CJSR 88.5FM broadcast the entire marathon on February 23rd and 24th 2016, and our local stories ran from 11:30PM-1AM MST. Listen here for CJSR’s contribution with hosts Daniel Johnson, Chris Chang-Yen Phillips, and Rylan Kafara. First they introduce the interview with Marlene Orr, who shares how the McCauley community’s Ambrose Place is having a positive impact through supportive housing, harm reduction, and Indigenous cultural practices. The second interview is with Sam Leibel, who started the amazing Society for Safe Accommodations For Queer Edmonton Youth. The final interview is with actors appearing in Boyle Street’s short film City Embers, a fictional movie about what life is like for homeless youth in Edmonton. The actors discuss the process of making the film, and the themes that resonate through the inner-city and the rest of Canada. Tune in to the 2016 Homelessness Marathon today from 3PM to 5AM MST! Every year, stations in cities across Canada take turns sharing local homelessness issues for the rest of the country to hear. Edmonton’s CJSR 88.5FM will be broadcasting the entire marathon, with our local stories running from 11:30PM-1AM MST. So if you’re a night owl, you’ll hear about how the Highlands community is ensuring it is a welcoming neighborhood for the homeless. There will also be an interview with actors appearing in Boyle Street’s short film City Embers, a fictional movie about what life is like for homeless youth in Edmonton. Sam Leibel will tell you how you can support the Society for Safe Accommodations For Queer Edmonton Youth, and Marlene Orr is going to share how Ambrose Place is having a positive impact in the community! Oh, and you can tune in online at CJSR.com by clicking right…here. The 2015 Homelessness Marathon aired across Canada on February 25 & February 26. 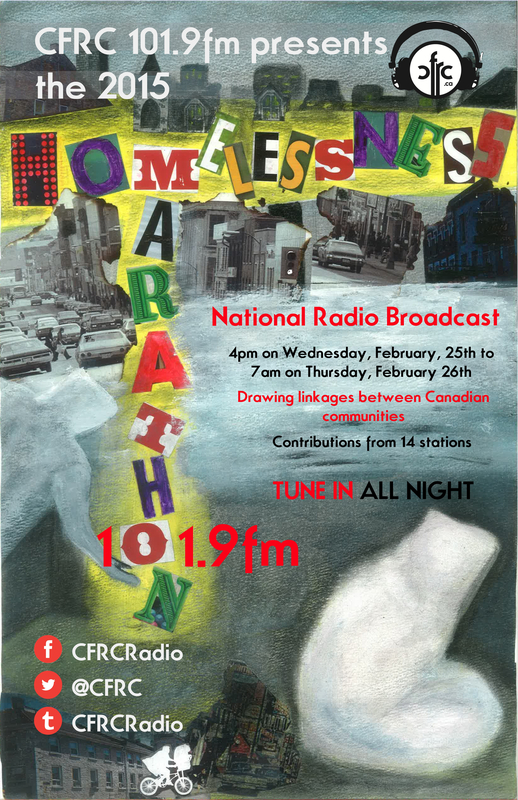 Hosted by CRFC 101.9FM in Kingston, 14 community and campus radio stations produced 15 straight hours of programming tackling homelessness issues. CJSR contributed Edmonton’s hour, with hosts Daniel Johnson and Rylan Kafara focusing on two major issues – the impact of gentrification in the downtown area on the inner-city community, and Missing and Murdered Indigenous Women in Edmonton and Canada. It included interviews with the University of Alberta’s Jay Scherer, MacEwan University’s Michael B. MacDonald, as well as cultural support worker Gary Moostoos, and a number of inner-city community members.